David Gordon Green unveils the latest in his series of lovable losers – curmudgeons, felons and misfits that have populated the likes of Joe, Prince Avalanche and Pineapple Express. This time he's cast acting royalty, in the form of Al Pacino – still commanding, if somewhat stuck-in-his-ways – taking on a role that makes great use of his weathered, stubbornly mesmerising visage, and ability to squeeze out some sympathy for the most wretched of men. He plays Angelo Manglehorn, a lonely American locksmith adrift in a world he no longer cares to connect with. He's a hopeless romantic, with an emphasis on the hopeless, writing letters to a long-moved-on lover, that are filled with regret and disillusion for his current circumstances. 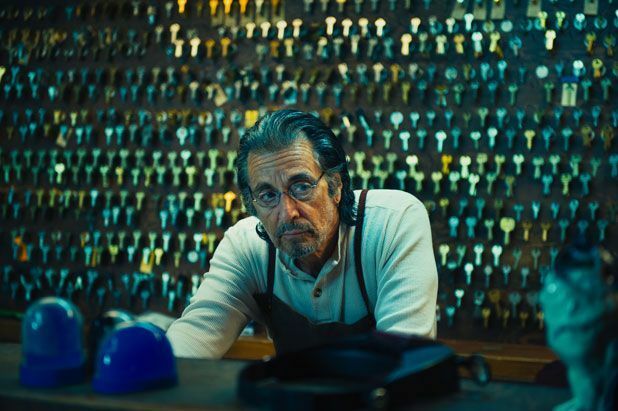 Pacino's talent for communicating disabling weariness recalls one of his career highs – his chronically exhausted cop in Insomnia – but Manglehorn is a capricious, undisciplined effort that makes for a rather bumpy ride, being as erratic and faltering as its embittered antihero. Nonetheless, the strained relationship Angelo has with his similarly damaged financier son Jacob (Chris Messina) is horribly convincing, especially as their superficial grievances and incompatible lifestyles give way to the even more painful truth. Thankfully, Green sweetens the deal with unforced, gorgeously silly interactions between our protagonist and his grandchild (an adorable Skylar Gasper), as well as the pleasingly askew sight of Angelo wandering out-of-doors with his beloved cat, and his first flushes of romance with ray-of-sunshine bank clerk Dawn (the marvellous Holly Hunter), who he bonds with over their love of animals, before that too turns sour. Spells of well-executed humour – including a wonderfully surreal serenade – offset the discomfort in an admirable but flawed film that's visually ambitious and that confronts difficult issues like isolation, romantic delusion and the terrible legacy of unchecked anger, not wholly successfully but with intermittent charm and no shortage of pathos. Screening on Tue 23 and Sun 28 Jun as part of the Edinburgh International Film Festival 2015. General release from Fri 7 Aug.